Scenario: Currency crisis/economic collapse while serving in the military or as a civilian contractor overseas. In this knowledge base article and video, Survival Think Tank examines a possible overseas get home bag for military and Other Government Agency (OGA) civilians abroad. Most of those out there that follow the Survival Think Tank already understand the merits of putting together a get home bag for those situations in which you might find yourself cutoff from your main supply lines. When serving in the military and on deployment abroad, you are in essence in a bug out status the moment you step aboard that aircraft or ship transport. You have separated yourself from your main line of supplies that remain home with your family, or in your barracks room on base/post. Most of us deployed in the military have limited storage space, forcing us into an unfortunate logistical situation. We would like to point out that the kit in this video is not an all inclusive list of everything you'll need when deployed, or operating overseas. Please keep in mind that this kit supplements kit that you would use every day as a US service person. We didn't include no brainer items like sleeping bags (you probably already have one in your tent/berthing/barracks), multi-tools, etc. Those items are part of your every day kit and are therefore not discussed. Below, we portray the grab and go emergency pack that TheRoadWarri0r will bring along during his 2012 deployments overseas. Firearms disclaimer: We did not include firearms in this overseas kit, as carrying personal firearms with you on deployment is likely prohibited by your unit and applicable federal laws. Use your own personal judgement, but be cognizant of the fact that if you are caught, you could be discharged from the military. Wouldn't it have been great if those soldiers were armed when the Fort Hood shooter went on his selfish rampage, killing over a dozen human beings on a major US Army base? Without further delay, let's begin outlining the overseas get home survival kit, which is really designed to get you back to the Continental United States as quickly as possible. Survival abroad (or anywhere) should always begin with the basics. The ability to store and treat water on the fly will be one of the most valuable capabilities in your pack. We've chosen the Sport Berkey Portable Water Bottle as our primary water treatment along with the portable MSR Miox purifier pen for particularly suspect water. Our suggested tactic would be to fill your internal reservoirs (bladder) until you can't drink anymore at EVERY water source along your journey, and then fill and purify your external reservoirs (water bottles, etc) prior to leaving your water source. Warning: Don't be tempted to drink untreated water from overseas 3rd world sources unless in a real and dire emergency. Dried food is likely your best initial option as it's light and portable. You'll run out quickly so you will need to establish your food plan in a hurry. This is where your precious metals and bartering skills might come in handy. You will not feasibly be able to carry more than a week's worth of food on your person, so you'll need to constantly be on the lookout for more fuel. You will potentially be spending some nights out in the elements in your attempt to get back to the Continental United States (CONUS) during a global economic collapse or currency crisis. Your resources will be limited, and it will be a good idea to keep a low profile. Your monetary resources might be tight along the way, forcing you to live a destitute or hobo lifestyle. You could be working your way across continents as a handyman or busboy or security for hire. Be ready. We chose the Hennessy Hammock for its portability and multi use form factor. Not only can it be used as a tent, it can be used as a seat or even a pack cover or as a means of rain/fresh water catchment. The only thing we didn't like about it is where it's made. You can order one at Plan B Outfitters using the STT discount code. Do your research. Chances are, if you are stuck abroad during a currency collapse scenario, your most likely injury will be foot blisters and hot spots from your heavy pack rubbing against your waist. You could be doing a lot of walking. Plan accordingly, assess, and bring the medical support items you think you might need. We like QuikClot, Moleskin, a variety of bandaids, anti-biotic creams, bandages, etc. Prescription medication should be at the top of your list along with any useful antibiotics you can grab prior to departing what is left of your fast dissolving military unit. Your medical supplies should be easily accessible with tactile function, meaning you'll want to be able to access your stuff in the dark or during other low visibility conditions. In the photo above, observe the red beads. Yank those, and your kit unrolls. You'll also want to be able to get to your medical supplies one handed in the event one of your arms is broken. This med pouch is made by First-Spear, and you can check it out here. If you you don't have comms, you are in a bad way my friend! In the book, SURVIVORS: A NOVEL OF THE COMING COLLAPSE, (highly recommended) written by James Wesley Rawles, a deployed active duty military soldier is forced to traverse continents and oceans to get back home during and after a full-blown global economic collapse. The character frequently employes an HF transceiver to communicate back home with morse code. Feel free to visit the expanding Survival Think Tank Book Store for more good reads that we've personally read and vetted. We also advocate bringing along a compact HAM radio, but it may not be practical or possible to communicate reliably around the world with a compact HF transceiver. With the Yaesu VX-7R (radio on the left in the photo above) you can monitor key frequencies and transmit on repeaters using applicable repeater directories. Do your research. About the size of an AR-15 magazine, this little HAM radio is worth its weight in your kit. You'll need to have a HAM license to transmit. Useful information about earning a HAM license can be found here and here. A drawback to satellite handsets, is that they are dependent on ground station support to maintain communication satellite constellations. 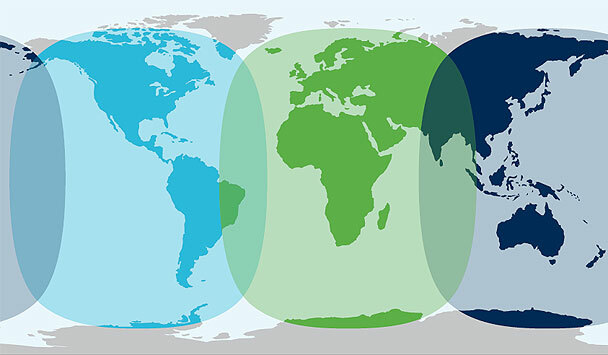 We still favor the user friendly satellite phone as most of the communications you'll need will likely take place in the initial months of implosion, a period when the INMARSAT constellation is still online, based on GPS constellation survivability studies. An added advantage of the handset we recommend is that you can quickly text or e-mail your GPS coordinates to recipients worldwide. There are quite a few other places besides Amazon that sell this handset. Do your research before purchasing. Review Note: We've personally tested the device moving at 22+ knots through the middle of the Atlantic Ocean, a thousand miles from land and we had no trouble getting a lock and logging on to the INMARSAT network for a call/e-mail. The handset will not work from the North and South Poles because of IMARSAT satellite orbit limitations (geosynchronous). See graphic below. Caution: Some military units may prohibit the possession of personal satellite handsets. You have been warned. INMARSAT Coverage. "Can You Hear Me Now?" Ultimately, your goal is get get back home to the good old United States. Without a means to pay your way back, you may become a permanent fixture in the country you find yourself formerly serving in. Chances are, you will not be the most popular person in town as an ex-soldier/sailor/airman or devil dog. Not an option. Acquire precious metals from reputable sources like APMEX before deployment. Do your research. Ten years ago, we may have recommended that you hold enough local fiat currency of the countries you anticipate to be operating in to pay your way home. With worldwide economic instability predicted in 2012 and beyond, we must recommend you hold precious metals so you may convert that real store of wealth into the local currency as needed, or barter your way home. We recommend US Gold and Silver Eagles. Also, be sure to secure your precious metals in a safe and clandestine location while deployed. Don't alert anyone to their presence, even your closest comrades. You may also study the target country in which you'll be operating in, and determine other portable and storable barter items that might come in handy along your way. This is uncharted territory. There will be a lot of assumption in this small paragraph. One possibility for transit across the ocean, is a sea freighters or other ship of suitable tonnage to make it across whatever pond you need to cross. Other options include foreign military air transport to the Americas. Be prepared to pay handsomely for your transit. We have researched cargo companies, shipping lanes, and schedules in anticipation of an upcoming deployment. We recommend you do the same. When do you leave your unit? This is a question you're going to need to answer for yourself. Leaving your military unit during a currency crisis or collapse is going to be risky business. Chances are, your chain-of-command will not release you until it's too late. Use your own judgement, and be prepared to face the consequences if you punch out too soon. Trust your gut. Your family will be there for you long after you leave the military service. Adjust your priorities accordingly. All Packed, Let's Hope We Never Need It! Packed with essential kit, our Arc'teryx Bora 50 bag weighs in at 28 pounds. Not too shabby considering the capability this bag provides and the force it multiplies. With this kit, you can drink clean water, eat for a few days, make shelter, fire, and even make an emergency call home or send e-mail from any where in the world. In closing, we'd like to stress the importance of getting your kit ready for your upcoming deployment and not waiting until the last minute. Do not find yourself in the vulnerable position of being told to "find your own way home" without resources. The global economic situation is very real. Ignore it at your own risk! Good luck on your overseas deployment and come back alive. We need you! Author is an active duty military officer and graduate of the navy's survival, evasion, resistance and escape (SERE) school located in Brunswick, Maine, and the USAF high risk capture SERE (SV-83) school in Spokane, Washington.